Want to be kept in the loop about follow up to this conference and other ECESP events? Subscribe to our newsletter! 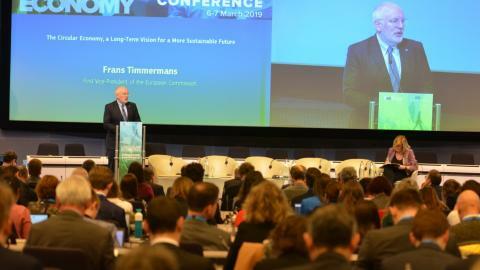 The European Commission and the European Economic and Social Committee hosted the 2019 European Circular Economy Stakeholder Conference on March 6 and 7 in Brussels.This conference build on the success of the 2018 event, which was titled Delivering on the Circular Economy – What's next? and followed the same format with two days in a row. All recordings and available presentations from Day 1 and reports from Day 2 workshops are now accessible in the table below. 6 March On Day 1, hosted by the Europan Commission, policy-makers and business leaders explored the action plan as a successful framework for the transition, while discussing what policies could allow Europe to capitalise on the current global momentum. It also widened the discussion to consider the circular economy as an enabler to achieve the 2030 Sustainable Development Agenda. All Day 1 photos and welcome speeches viewable separately here. Parallel session on 'Global Leaders in circular economy'. What is industry doing to achieve a circular plastics economy? All 70 pledges submitted by the Circular Plastics Alliance will be available on the ECESP website shortly. In the meantime, the European Commission has published a report on these pledges as part of the 2019 Circular Economy package. 7 March Hosted by the European Economic and Social Committee, Day 2 was prepared jointly with the Coordination Group members of the European Circular Economy Stakeholder Platform. This day featured eight different participatory workshops, whose purpose was to share successes and identify new challenges. Market lounges, networking tables, a cultural program and showcases of circular use of materials also provided further opportunities for networking to participants. 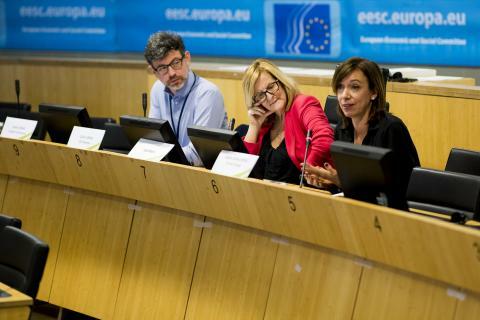 The EESC study mapping CE strategies in Europe will be published on the ECESP website in May 2019, while work has also begun on "Developing synergies across different circular economy roadmaps". The EU GPP criteria and circular procurement - a relevant tool? 2018 - Delivering on the circular economy - what's next?